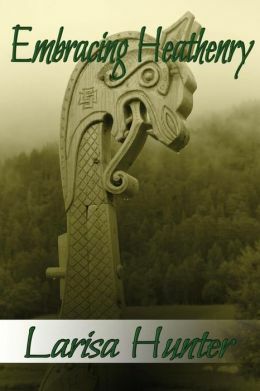 In the first part of this book, author Larisa Hunter, formerly known as Mist, tells the story of how she converted from her birth religion as a Jehovah’s Witness and embraced heathenry. It’s fascinating and has a conversational tone, and it almost feels like I’m sitting in the same room listening to her. That was great fun for me because I’m a Facebook friend with her and so I was already interested in hearing more about her life and her journey. Hunter also gives advice about becoming a heathen, interacting with the gods, acquiring a patron god, and joining a kindred. The section about kindred oaths made me re-examine an uncomfortable time from my youth and I came to a greatly relieved new understanding. It’s good to think about things and see them from the perspective of what one knows now, versus what one knew then. I really liked the section on sacred theater because I’ve recently become convinced that the Eddas were originally intended to be performed and that we’re missing a lot by only getting to read the dialogue, especially since some of it was obviously changed in the conversion era. Although, when I first got to the part where I was picturing improvisation with people being skinridden it kind of made me squirm thinking of what could go wrong. It really resonated with me that we should make ritual fun, that we should be practicing practices that make us want to engage with the gods because we like it and them, it shouldn’t be boring or a chore like sitting through a sermon in a church on Sunday and then forgetting them the rest of the time. All of life should be lived because we like life, and that’s a lesson I’ve only learned just this year so it’s still fresh for me. There are lots of little life lesson just like that sprinkled through this book because the author is unafraid to reveal her personal journey. There are also sections on engaging the gods through craft and creative pursuits, rituals, prayers and poems for honoring the gods. The book is filled with photos of artworks, recipes, and other fun and personal touches. The final section of the book is a series of essays by other people about their own experiences. Some of the essays really spoke to me. I heartily recommend this book as a personal story of one heathen’s journey, and as a storehouse of good advice for those who are a little farther on their path and ready to go beyond the beginner level.